This highly practical digital marketing Master's degree will equip you with the theoretical knowledge and applied skills to be able to design, deliver and evaluate successful strategies and campaigns. If you are looking to top-up your skillset and are unable to commit to the full programme of study, there is the opportunity to study modules on an individual basis. The course aims to introduce you to a wide range of technologies and techniques, providing you with an overview of the digital marketing landscape. It is delivered with significant input from industry partners and much of the work you will complete is based on live digital marketing projects in collaboration with real businesses including website and SEO audits, content creation, marketing and digital PR. This allows you to develop a portfolio of real world experience as you study and build relationships with industry. You will learn and produce a range of media, focused on a digital marketing context, including web-design, audio/video recording and editing and graphics processing. You will analyse, evaluate and critically appraise digital marketing concepts and develop campaign strategies for real life business scenarios. You will explore the importance of PR in the digital marketing sphere and gain first-hand understanding of how to approach digital PR in a strategic context. You will work in teams to design strategic campaigns that showcase your knowledge and skills. You will begin to explore a wide range of research methods for your Project/Dissertation. The Project/Dissertation can take the form of a practical project, such as an analysis of a real business problem, as an alternative to the traditional academic dissertation of 15,000 words. You will work independently but under tutorial supervision, to undertake the research and prepare the project/dissertation. You will engage with the course through online and on campus learning materials, lectures, tutorials, industry-led workshops and live client projects. These comprise of a mix of group study, discussion, simulation and presentations of findings by teams and individuals. Access to our virtual learning environment, CampusMoodle, is also provided giving you access from home to learning materials (including videos, e-books and journals). You will combines aspects of online learning and on-campus delivery. You will benefit from the support of CampusMoodle but also face-to-face interaction with tutors and classmates. Please note the below activity summary represents full-time on campus mode only, part-time mode will differ. The course requires you to become independent 'open learners' and take responsibility for when, where and how your learning occurs. You will spend approximately 15-20 hours per week working on your own, undertaking prescribed reading, preparing for group activities and researching and writing course reports. Please note the below assessment period represents full-time on campus mode only, part-time mode students will study the same number of assessments but over a three year period. Our teaching team consists of digital academics and practitioners. Other staff members include industry experts who offer guest lectures, masterclasses and workshops. Our industry links provides you with the opportunity to learn first-hand from professionals about the practical challenges which you may face in your working lives. Recent industry partners and guest speakers include Fifth Ring, Weber Shandwick, Equator, Red Evolution, and Aberdeen International Airport. You will have the opportunity to undertake a four-week period of professional industry experience in a digital marketing role, which will enable you to put into practice the knowledge and skills developed throughout the course. You will have access to our Placement Office, who will support you remotely in sourcing and validating a suitable position. 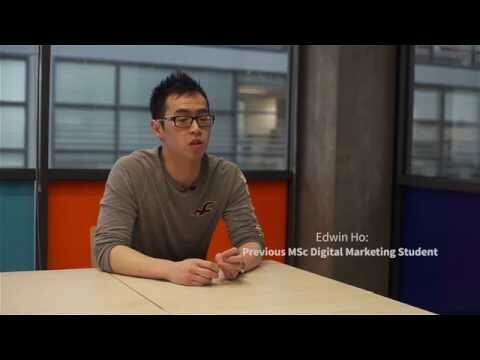 The digital economy has been recognised as a key area of growth and strategic importance to the Scottish, wider UK and international economy and as such it is not surprising that the job prospects leading from MSc Digital Marketing are significant. The course will prepare you for a range of digital marketing careers and roles in a variety of industries including Tourism, Oil and Gas, Professional Services, Public Sector, Private Sector, Hospitality, Marketing and Communications, PR, Technology and Finance. Possible roles include Digital Marketing Manager, Social Media Manager, Community Manager, SEO Manager, Digital Strategist, Online PR Manager. Previous graduates have started their own business, work as freelancers and gone into agencies such as Stripe Communications, QueryClick, and MediaCom. Some have set up their own digital agency. Applicants normally hold a 2:2 undergraduate honours degree or its equivalent in any subject area. Applicants with a lower degree classification and / or relevant work experience will be considered on a case by case basis. The MSc Digital Marketing course has equipped me with the confidence, experience and necessary tools to be successful as a graduate and productive at my place of work. A great investment overall! This course is accredited by The Institute of Direct and Digital Marketing (IDM) - the UK's only government-approved institute for the professional development of direct and digital marketers. Digital Marketing Strategy is accredited by SISA Level 1. The BA (Hons) Management with Marketing degree explores all aspects of marketing with a firm focus on the end consumer. The course will not only ensure you understand the theoretical aspects of Marketing but will provide you with plenty opportunities to put your knowledge into practice. This accredited International Marketing Management degree is designed to develop your knowledge and understanding of domestic and international marketing theory and current business management practices. On successful completion you will be able to make an immediate and effective contribution to the operations of an international or national company within the field of marketing. This CIPR accredited course provides you with the practical skills and relevant academic knowledge to ensure you will be capable of operating in a strategic communication role on graduation.